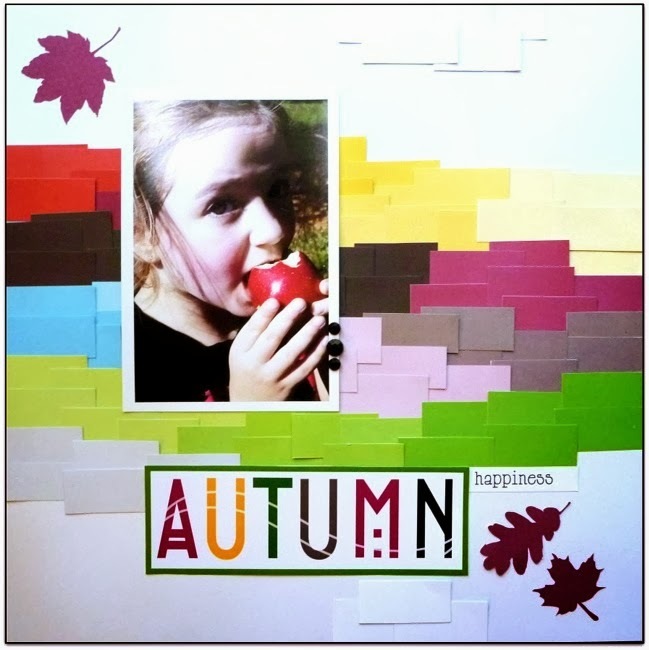 Blog Quick Quotes: Autumn Happiness with Dana! Hi Quick Quotes fans! Dana here today sharing a fall layout that I created with the October Club Q Page Layout Kits. The Club Q Kits this month include patterned papers from the new Happiness Collection. The color palette is fantastic for fall. The Happiness line combines traditional Autumn hues with several bright shades for a fun, fresh color palette that is so fun to work with! My family recently visited a local apple orchard and I captured my daughter enjoying her first fresh apple of the season. The Happiness 400 patterned paper features a colorful rectangle design. I cut the paper into individual rectangles, sorted them by color and then overlapped them to created a fun background for my page. I cut this vibrant title block from one of the die-cut sheets included in the Club Q Kit. The wave design traveling across the letters had me thinking about cool breezes and swirling leaves. I finished my page with some patterned leaf die-cuts. All that work was worth it! Love the way you layered all of the colors... very cool!